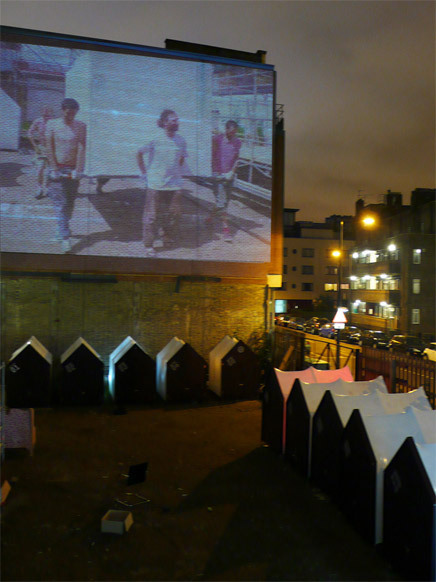 An exciting temporary lido, created by acclaimed French architecture collective EXYZT and filmmaker Sara Muzio appears on Union Street, London SE1 0NL this summer. Following in the tradition of Roman baths and Turkish hammams, which provided a setting for social gathering, ritual cleansing and uninhibited political discussions, the Southwark Lido hosts a variety of activities in an unusual, architecturally innovative environment. 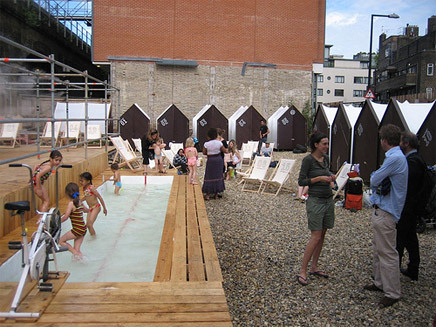 Curated by The Architecture Foundation , the Lido provides bathing and breathing space for the general public, residents of Southwark and visitors to London Festival of Architecture alike. 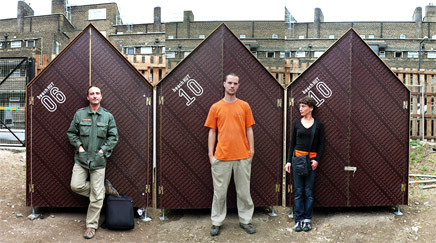 Within a futuristic low-tech complex, visitors of all ages can enjoy the refreshing spray of the water deck, or sweat it out in a sauna; there is a paddling pool for children; beach huts doubling as changing rooms and living pods for staff; a sun deck; a bar operated by east London restaurant Bistrotheque. On hand to assist visitors is the lido team wearing uniforms designed by House of Holland. 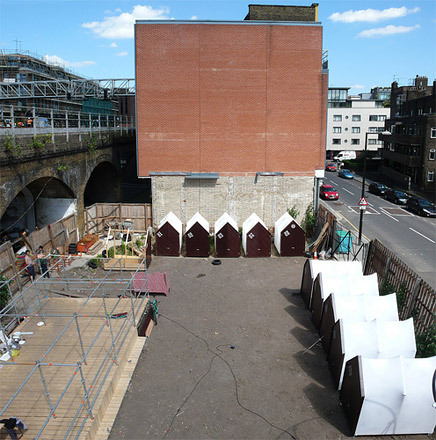 A mobile garden is adding color, created on-site in collaboration with Bankside Open Spaces Trust, which distributes throughout the neighborhood at the end of the Festival. 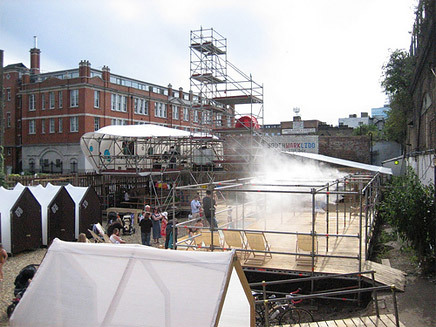 The Southwark Lido expresses EXYZT’s strategy of urban renewal, based on the idea that a community of users actively creating and inhabiting their urban environment is key to generating a vibrant city. This project explores the potential of using a site in transition from empty lot to new residential and office buildings, generously lent by Solid Space , to create a vibrant point of community and cultural engagement during its transformation. 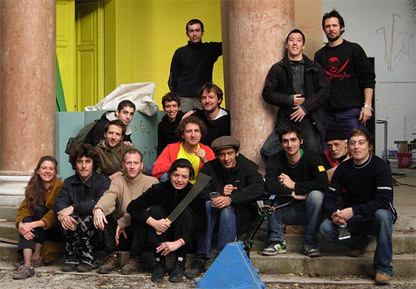 The run-up to its installation saw the organizers forming links with the local community and specific groups, providing them with a new place to hold events and share their work. The Lido sits within LFA2008’s Southwark & South Bank Hub curated by The Architecture Foundation, which occupies a dynamic part of London that has moved away from its traditional label as “the other side” of the Thames. It is now a major cultural quarter, with key venues like Tate Modern sitting alongside proposed urban redevelopments such as The Shard (Renzo Piano’s new office tower) and developments at London Bridge. Lively activities across the Hub will build on the area's history, reveal a hinterland of hidden territories and offer new visions for the contemporary city. Construction and activities at this temporary settlement started on June 20, with a program of public events from July 9 through 13. 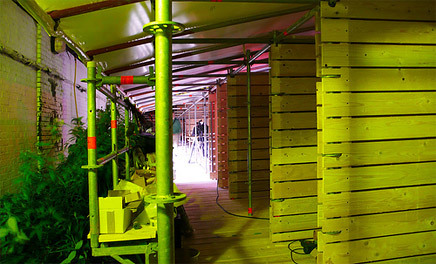 Paris based Exyzt initially comes from 5 architects' desire of building alternative architecture together. The E,X,Y,Z,T, are Nicolas Henninger, François Wunschel, Phillipe Rizzotti, Pier Schneider and Gilles Burban, all architects D.P.L.G. The team is now a community of people who have chosen to act under the same principle of sharing knowledge and abilities, extending their network over national borders by collaborating with people around the world. Past projects by EXYZT include: LabiChampi, a Mushroof construction and festival in Karosta, Latvia; Metavilla, converting the French Pavilion into an inhabited villa at the 10th International Architecture Biennale, Venice, Italy; S.E.T., an inhabited launch-pad for the Agbar Tower in Barcelona, Spain; and EKTOP #1, an urban satellite in the garden of les Halles as part of the Nuit Blanches 2005, Paris, France. 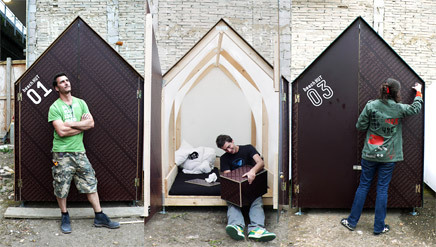 Wow, I love this proposal as an urban design community-building intervention!! Very cool, and so optimistic. What's the structure of the little cabanas: do I see a twisted piece of wood? I have to say that the mist jets making fog after the sun went down was very cool. Combined with the music and all the people it was a great atmosphere. The free happy-hour beers probably helped too. It was nice to see Londoners interacting with each other for a change. A few kids were having a great time in the water and playing with the bike-powered fountain. A real shame it can't be permament, but it would just get overrun by hipsters in no time. The cabanas are timber framed with Korinplex (film faced plywood) for the doors and the same kind of PVC canvas as the big blob stretched over to keep the rain out. If you look at the tower in the fourth photo you can see the first of what became four tents up there. Bit too close to the trains for my liking but it would make for a great view. antipod, thanks muchos for the details! free happy hour beer? I'm all about it! !